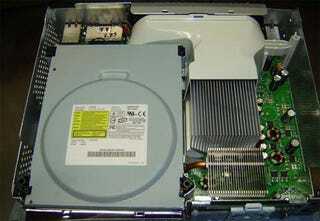 The new Xbox 360 has a 60GB HDD, which is new, but what about the rest of the console? Anything new inside the unit? Hacker extraordinaire Ben Heck got hold of one and busted it open like a naughty coconut to find out. What he found was that the new console has the same GPU, same 65nm CPU and same heatsink as we've been seeing for a while now, so don't expect any heat/noise improvements on that front (at least for the next few months), though he did notice that some of the console's memory chips have been moved from the bottom of the board, which should ease up on heating in that part of the 360. Other than that...yeah, it's a 360, with 40 extra GB.